The ancient city of Maresha (located next to Beth Guvrin) contains some of the richest archaeological finds in Israel from the Hellenistic Period (ca. 3-2ndcenturies BCE). This was a time when the city was a major crossroads and commercial centre. Discoveries at Maresha have illuminated how the region’s diverse cultures and ethnic groups interacted. The city was conquered in 107 BCE, by the Maccabean King John Hyrcanus I.
Maresha was first excavated in 1900 by Bliss and Macalister on behalf of the Palestine Exploration Fund. In 1988 Dr. Amos Kloner of the Israel Antiquities Authority and Bar Ilan University returned to the site, working there until 2000. Since 2000, the Maresha expedition has been headed by Dr. Ian Stern, along with Bernie Alpert, of Archaeological Seminars Institute (ASI) and Hebrew Union College (HUC) in coordination with the Israel Antiquities Authority and the Israel Nature and Parks Authority. Maresha is now a national park and a UNESCO world heritage site, best known for the thousands of subterranean caves and chambers that underlie the remains of the ancient Hellenistic city. This wondrous, mysterious, underground city is a favourite destination for family outings, tourist visits and school trips. Hundreds of thousands of people have excavated the caves with ASI’s “Dig for a Day” program. Many of the discoveries have been astonishing. Last month, while excavating in one of the subterranean complexes, the ASI-HUC team of archaeologists uncovered an opening in the side wall of one of the caves. 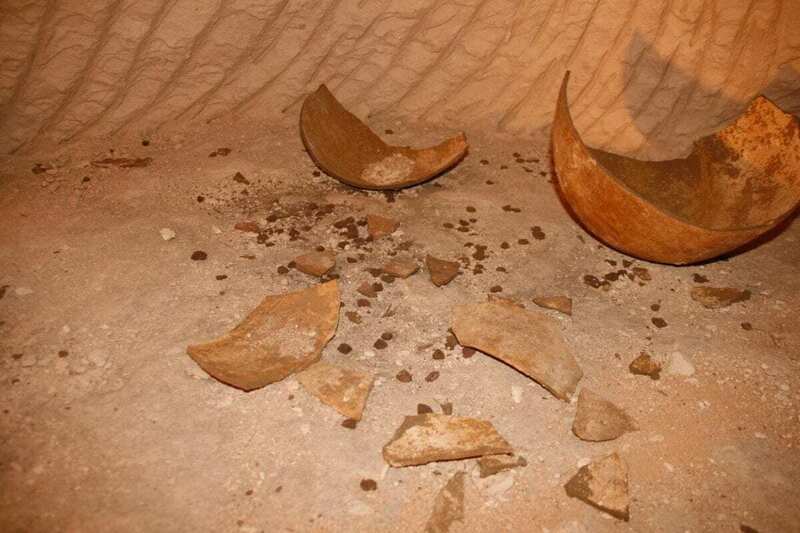 Initial exploration revealed seven rooms containing both broken and complete pottery vessels strewn over the surface. Most of these vessels were dated to the Hellenistic period—familiar material to the ASI-HUC team from the previous decades of excavation at Maresha. But it was soon evident these rooms had been disturbed in antiquity. Walls had been breached or broken and trenches had been dug. Among the many Hellenistic period vessels were two oil lamps and a casserole dish from the Roman period. These later remains stood out since the city had been abandoned ca. 107 BCE and later remains are rare. 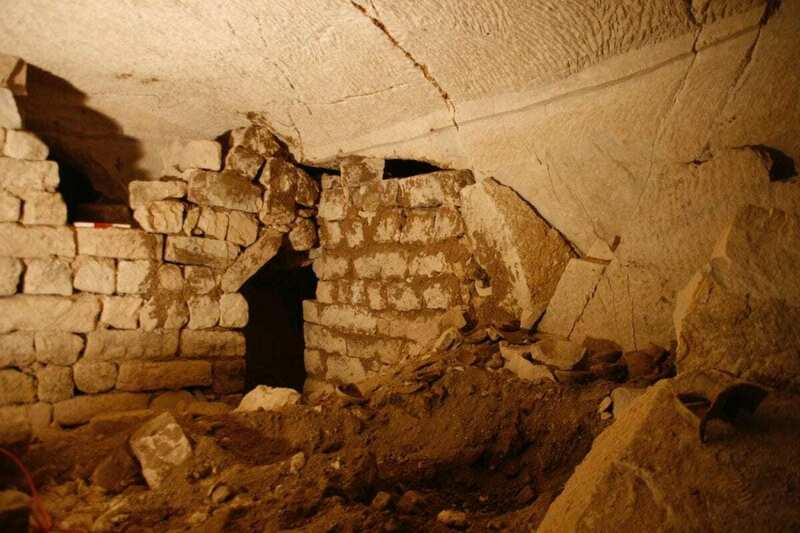 Since a number of subterranean complexes in the region had been utilized during the Bar Kochba revolt (132-135 CE), this led us to believe that these rooms possibly served as a refuge for the Jewish population in the area during that rebellion. One small room had been overlooked during our initial survey. Upon a return visit, Asaf Stern, the ASI-HUC field photographer, entered the room for a closer look with proper lighting. A minute later he scrambled out trembling with excitement. On the floor, among a group of large broken storage jars, lay more than 1000 clay bullae, or sealings (bullae is plural for bulla). These unfired bullae sealed the knots of twine binding papyrus scrolls—hundreds of them–that did not survive their 2000 years in the caves’ moist atmosphere. The imprint of the string and the impression of the papyrus is still visible on many of the bullae. If a seal was broken the recipient of a document would have known that the contents had already been read. The unfired sealings are extremely fragile and each was carefully collected and brought to the labs of the Israel Antiquities Authority in Jerusalem. One of the world’s leading experts on such bullae, Dr. Donald Ariel of the Israel Antiquities Authority, examined a batch of 300. The images on the sealings include Greek deities such as Athena, Apollo, and Aphrodite as well as cornucopia, erotica, animals, and more. His initial impression is that the bullae represent a very large private archive. These bullae can now be added to the wealth of finds and the hundreds of inscriptions in Greek and Aramaic, discovered at Maresha, which have already riveted the attention of scholars throughout the world. Maresha is our richest source for understanding the multicultural world of Hellenistic Israel. This latest sublime discovery will take several years to catalogue and analyze. Stay tuned for future developments!